It’s becoming clearer every day that we need to take action to save our planet, we all now know about the impact of plastic. You just have to hop on and do a quick Google search to find out the truly devastating impact the population is having on our beautiful little planet. And you don’t completely need to change your lifestyle in order to live a more sustainable life and help the planet, and even just a little can have a huge effect. Now, I don’t know about you, but I drink a lot of tea and coffee; and I am a regular visitor to my local coffee shops to get that caffeine hit. Every time I go in, I am always there with my trusty reusable coffee cup - whether it be my little Corkcicle Stemless Coffee Cup or my huge 750ml Chillys bottle - for my coffee to go into and save using those evil coffee cups. And coffee shops themselves are getting targeted for their lack of sustainability, most chain coffee shops now have a little recycle tray where they will recycle their cups that you can’t recycle yourself. Every day I go in I notice more and more people armed with their reusable coffee cups. You feel happy seeing other people take that little step to caring about the planet. But then in their other hand I see a plastic bag filled with loads of plastic wrapped food! So, I decided to take a look at how we can make little changes in our everyday life to help the planet a little more and lead to us living more sustainable lives. We all know how bad plastic bags are for the planet, they can take up to 1000 years to decompose. 1000 years! This is a change that can be made so easily. Reusable carrier bags are available to buy in every single supermarket and are cheap as chips. You can load up on these or keep using those plastic bags you keep stuffed in a drawer until they die. Do this and keep two or three everywhere: by the front door, in the boot of your car, in your bag (if you have those cool ones that fold up really tiny). By keeping them in every place possible, you will never forget them! This one is hard I know. 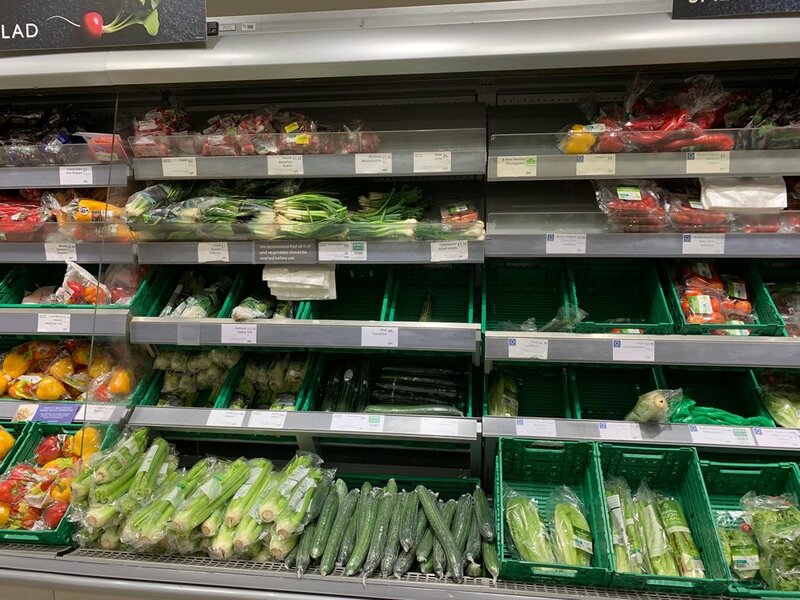 I went and took a look in my local supermarket to see how much fruit and vegetables I could get completely plastic-free. It was not easy, just look at the amount of plastic I found! If you are as disgusted at this as I am, you can change it very easily! Pick every option in your local supermarket to buy not in plastic, such as loose carrots, potatoes, peppers etc. Make use of your greengrocers, butchers, bakers, and fishmongers. These used to be dying out, but with the growing awareness of sustainability they are slowly on the rise once more. These places use very minimal plastic, if any, and by going to these shops instead you are supporting your local businesses. With food such as cheeses etc. it is much harder to avoid plastic. Make use of the counters in your local supermarket which will usually have sections that mean you can get your food in the exact amount you need with very little plastic used. Markets are probably one of the best things in your community, and usually take place weekly. Not only are you supporting independent businesses, you tend to get more food for your money, and can also get produce and products you wouldn’t find anywhere else. You can also make a day of it, wandering around the markets and then going for a quick bite to eat or a coffee with your friends. And the best bit is, markets take place in basically every community, and if not one very close nearby! Now this may not be for everyone. However, all you have to do is take a look around a supermarket to realise that all meat is covered in plastic. As well as taking up number 2 and going to butchers and fishmongers, you can also take up a less animal based diet. You don’t have to give it up completely if you don’t want to, but you can take part in ‘meatless mondays’ for example. Not eating meat for one or two days not only helps the planet, it will make you more experimental in the kitchen and will also make your grocery shopping that little bit cheaper. Before you leave the house, always make sure you have your reusable coffee cup on you. It is very easy to make an exception when you forget it, but the “oh just this one time won’t hurt” can turn into just using the coffee shop cups. This is a change that I have had to do, and I did it by simply making one rule: no coffee cup = no coffee for me. That simple rule has made me remember my coffee cup every time I want that caffeine and also helps me stop spending so much on coffee if I purposely don’t bring it with me. This is something that will help the planet as well as help you! Buying your lunch every day in your lunch break not only is expensive, but the packaging is atrocious for the environment, and most of it isn’t even recyclable. By setting out each week what you want to eat for lunch and taking it in with you, you can save money, eat healthier and save the planet. If you wanted to take it a step further, you can also get a lunch box. These are great as they keep your food completely separate from what else is in your bag, and usually also have an insulating film on the inside, so any spillages don’t make their way into your bag. In the winter, it is also a great idea to invest in a little thermos container and bring a nice warm meal into work with you for a warm up as well as a power up. I hope that these tips and tricks will help you take a step into changing little things in your everyday life and begin to lead a more sustainable life. In the future hopefully, supermarkets will get the same pressure that coffee shops have had in reducing plastic and begin to do more when thinking about the planet. You don’t need to try and take on everything at once; start small, maybe with one of these points, and when you can begin to do more and more. No one is perfect and even just making sure you bring your reusable bags with you is a massive achievement. Be proud of every little change you make. This article is written by Stay Wild family member Caitlin Carter.